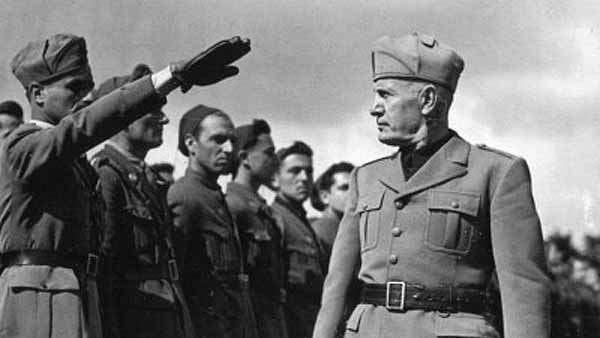 Mussolini inspecting troops during the Italo-Ethiopian War. One of the major means of “approval” from our “betters,” as Thomas Sowell astutely refers to our self-appointed collectivist elites, are all of the regulations which permeate an astounding amount of activities in our lives; but, of course, this for our own protection according to the collectivist. This is not what our Founders intended for our lives in the United States, nor what we should intend or accept for ourselves. Unfortunately, the assurance [collectivists] people derive from this belief that the power which is exercised over economic life is a power over matters of secondary importance only, and which makes them take lightly the threat to the freedom of our economic pursuits, is altogether unwarranted. It is largely a consequence of the erroneous belief that there are purely economic ends separate from the other ends of life. In fact, “the notion that governments were the ultimate arbiter of resource allocation lay at the core of economic planning, leaving little room for any sort of private sector…Socialist policies that had placed government at the center of economic activity and nationalized much of the private industry were believed to be the fastest route to economic prosperity,” writes Dambisa Moyo, a Zambian born, American educated economist, in her groundbreaking book, Dead Aid. Moyo explains in great detail how the statist view and actions of the West in Africa has perpetuated its poverty and destitution. Moyo writes that the West – in believing it knows what’s best for the African nations and that its managing of their wealth distribution (which comes from each American citizen’s pocket through taxes) is what is best for them – structured aid in the form of loans to help cover Africa’s debt, already due to financial aid. Reagan reported in 1978 that “[d]uring the New Deal days [the Roosevelt administration], an under-secretary of the treasury wrote a book in which he said that taxes can serve a higher purpose than just raising revenue. He said they could be an instrument of social and economic control [social justice] to redistribute the wealth and income and to penalize particular industries and economic groups.” That is exactly what the Roosevelt administration did with devastating results to the economy. The New Deal “was so patently self-defeating that it’s hard to believe anyone seriously believed it would work,” writes economist Robert Higgs. Friedrich A. Hayek, 2009 (Originally published in 1948), Individualism and Economic Order, “Individualism: True and False,”1945, (Auburn, AL: Ludwig von Mises Institute), p. 27. Friedrich A. von Hayek (Bruce Caldwell, Ed. ), 2007 (originally published in 1944), The Road to Serfdom: Text and Documents, . (Routledge, London: The University of Chicago Press), p. 125. Thomas Sowell, December 25, 2012, “On Christmas, Liberals Are By No Means Liberal,” townhall.com, [http://townhall.com/columnists/thomassowell/2012/12/25/random-thoughts-n1473508/page/full/]. Friedrich A. Hayek, Spring 1949, “The Intellectuals Socialism,” The University of Chicago Law Review, p. 417. Reprinted August 16, 2008, Mises Daily, (Auburn, AL: Ludwig von Mises Institute), [http://mises.org/daily/2984/]. Dambisa Moyo, 2009, Dead Aid: Why Aid is Not Working and How There is a Better Way for Africa, (New York, NY: Farrar, Straus and Giroux), pp. 19-20. Dambisa Moyo, 2009, Dead Aid: Why Aid is Not Working and How There is a Better Way for Africa, (New York, NY: Farrar, Straus and Giroux), p. 19. Dambisa Moyo, 2009, Dead Aid: Why Aid is Not Working and How There is a Better Way for Africa, (New York, NY: Farrar, Straus and Giroux), p. 28. Dambisa Moyo, 2009, Dead Aid: Why Aid is Not Working and How There is a Better Way for Africa, (New York, NY: Farrar, Straus and Giroux), p. 50. Kevin R. C. Gutzman, 2007, The Politically Incorrect Guide to the Constitution, (Washington, DC: Regnery Publishing, Inc.), p. 149. Interview with Ronald Reagan, May 17, 1976, “Republicans: Now the Republican Rumble,” Time, Vol. 107, No. 20, p. 12. Robert Higgs, February 1995, “How FDR Made the Depression Worse,” The Free Market, Vol. 13, Number 2, (Auburn, AL: The Mises Institute). C.J. McNair and Richard Vangermeersch, 1998, Total Capacity Management: Optimizing at the Operational, Tactical, and Strategic Levels, (Boca Raton, FL: St Lucie Press, The IMA Foundation for Applied Research, Inc.), p. 148. For a more detailed account on the Roosevelt administration’s and the NIRA’s assault on accounting practices and accounting history in the United States see the section “The Blue Eagle Soars” pages 174 to 187. Robert Ajemian, interviewing Ronald Reagan, May 17, 1976, “The Nation: I’ve Had a Bum Rap,” Time, Vol. 107, No. 20, p. 19. CJ McNair, Ted Watts, and Richard Vangermeersch, Working paper 2012, “Conditional Truth: The Rhetoric of Cost in Twentieth Century America,” (Copy sent to author by Dr. McNair), pp. 11-12. CJ McNair, Ted Watts, and Richard Vangermeersch, Working paper 2012, “Conditional Truth: The Rhetoric of Cost in Twentieth Century America,” (Copy sent to author by Dr. McNair), p. 17. For details see CJ McNair, Ted Watts, and Richard Vangermeersch, Working paper 2012, “Conditional Truth: The Rhetoric of Cost in Twentieth Century America,” in its entirety. James P. Warburg, 1936, Hell Bent for Election, (Garden City, NY: Doubleday, Doran & Company, Inc.), p. 16. Richard K. Vedder, PhD, is an economics professor at Ohio University and not only an economics scholar; he has also researched and written extensively on economic history in the United States.